Joseph Alderman (1843-1933) was born on 27th April 1843 the 8th child of Charles and Hannah (nee Tarry) Alderman. He was well educated for the time and a staunch member of the Primitive Methodist chapel. On 6th April 1868 he married Louisa Mildred Claridge of Swanbourne at Marylebone in London. She was the daughter of Henry Claridge, tailor of Swanbourne. They set up business in Swanbourne, with Joseph as tailor and Louisa as tailoress, living in Nearton End Swanbourne. They had two children in Swanbourne: Amy (1870-1956) and Florence (1872-1955) who married James Ward (1879-1974). In 1873 when the National Agricultural Labourer’s Union (NALU) called a strike in Swanbourne, Joseph Alderman became the committee secretary. However after the strike many people left the village. Amongst those that left were Joseph Alderman, and George Harrison (1823-1895), who had married Joseph’s elder sister Mary (1830-1878) in 1858. Joseph and Louisa Alderman moved to Widnes, Lancashire and there they had two more children Thomas (1874-1957) and Daniel (1875-1951) born at Widnes. 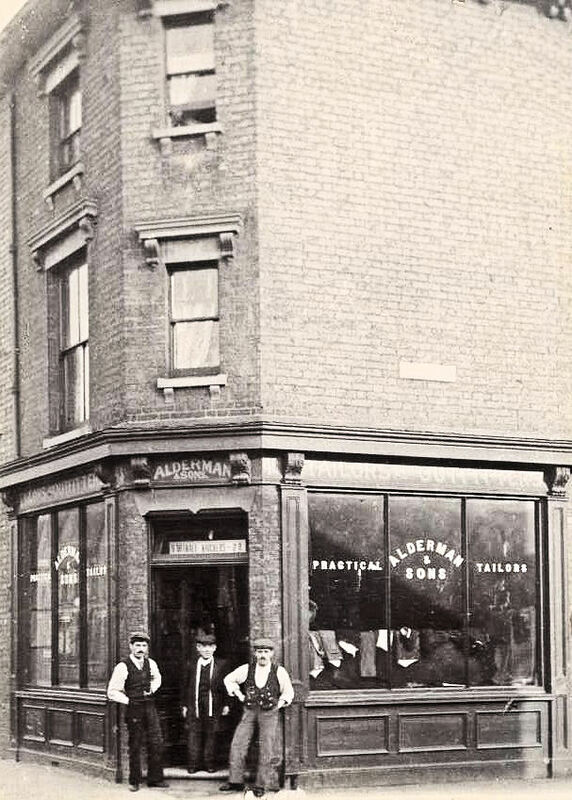 Alderman & Sons – tailors. In 1877 Joseph established a tailoring business in Peterborough, and got involved with the Primitive Methodist chapel. Where he lived in St Mary’s Street, became known as Alderman’s Yard. Joseph and Louisa had more children in Peterborough: Thomas Alderman (1874-1957), Daniel Alderman (1875-1951), Mary Hannah Alderman (b 1878), Lily Louisa Alderman (1883-1971), Rosa Alderman (b 1885), Ethel Dot Alderman (1886-1887), Ada Minnie Alderman (1887-1954), Joseph William Alderman (1889-1919) and Charles Henry Alderman (1890-1973). Their youngest sons Joseph W. Alderman and Charles H. Alderman both served in the Great War. Joseph Alderman’s business later became Joseph Alderman and Sons, Tailors and Outfitters, which he ran with his sons. He started in St Mary’s Street, but later opened up two shops in Geneva Street and at 43, Lincoln Road. Meanwhile he used to keep in good contact with his Alderman relations in Swanbourne and elsewhere, and wrote letters to keep up with what was going on in the family and at the chapel, which he signed “Uncle Joe”. He sometimes sent suits to relatives, and would travel by train to visit his brothers and sisters. In 1877 along with the Aldermans, the Harrison family also moved to Peterborough. Mary Harrison, Joseph’s sister, died 16th October 1878 in Peterborough and the next week her son William Harrison died aged 11. George Harrison died in Peterborough in 1895, and descendants of their son Charles Harrison (1862-1943) still live in the Peterborough area. In the 1880s Joseph Alderman’s brother Thomas Alderman (1837-1925) took a farm at Luddington in Northamptonshire. He lived there with his wife Emma and their daughter Jane, and son-in-law George Cook. In 1884 they had a later son called Edlin Thomas Alderman (1884-1971), and in 1901 Edlin Alderman married Sarah Jane Dunkley (1876-). In 1911 Thomas Alderman was living on the Luddington farm with his son Edlin and Sarah Alderman and their three children: Evelyn Doris, William Thomas and Edlin Mervyn Alderman (1910-1985). Being only 30 miles from Peterborough they would see their cousins at Peterborough, and in 1932 Edlin Mervyn Alderman married his second cousin Constance Mary Ward (1908-1999), daughter of James and Florence Ward, and grandson of Joseph Alderman, and their descendants still live in the Peterborough area. In the 1911 census Joseph and Louisa Alderman were living above the shop at 43, Lincoln Road, Peterborough with their daughter Ada and their son Charles. Louisa Alderman died in 1915 aged 66 and was buried in Broadway cemetery in Peterborough. In the 1920s Joseph Alderman was living at 41, Taveners Road, Peterborough. He died on 18th September 1933 at Peterborough aged 90. Many of his descendants still live in the Peterborough area. Sources:-letters from Joseph Alderman, census returns, advertisements in the Peterborough directory.